I’ve sadly been negligent in keeping up with my blog writing for the past couple of weeks, as I’ve been visiting and traveling up in Washington State. My adventures have dug up one particularly exciting treasure with regard to this blog, though. Last year I wrote a blog post about my first tornado, which I saw way back on July 3, 1998 (see Post 100: 12 Years Ago Today…). While I was scared stiff of this weak, short-lived tornado, my fear and fascination encouraged me to begin studying severe weather. I cultivated this interest and ultimately this led me to apply to the School of Meteorology at the University of Oklahoma. As I stand between two chapters in my life, reflecting on the past several years at Oklahoma and looking forward to new adventures on Kwajalein, my two oldest friends just gave me the best gift I never knew existed. 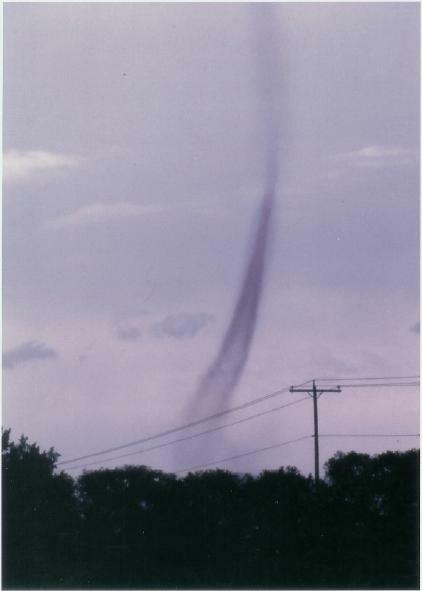 This, ladies and gentlemen (drum roll, please), is a scanned version of a photo taken by John Ebenal, on July 3, 1998, on the south side of Ellensburg, Washington, looking east-southeast towards my FIRST tornado. My twin friends Laurel and Mary lived a mile down the road from us in Ellensburg, and their family saw this tornado just before we did. I was under the impression none of the photos John took turned out, but Laurel and Mary found this one I think as they were moving to Sequim (I visited them there this past weekend). After 13 years, I couldn’t be happier to have been given a photo of my first tornado, a tornado that made such a deep impression on my life. Note this tornado really is quite skinny and weak; you can’t see just where it connects to the cloud base, but there was indeed a funnel extending down from the cloud. This tornado looks like a landspout, which, simply put, is a non-supercell tornado (i.e., a tornado that comes from a storm that’s not rotating). Thanks to John, Sherrie, Laurel, and Mary!